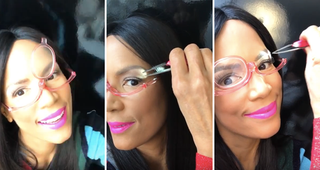 Reading glasses for makeup are a thing. Tweezers with a built-in flashlight are a thing. Put those two things together and you have the best team ever when it comes to plucking your brows, putting on false eyelashes or drawing on eyeliner. I don’t wear glasses just to look smart—I need them—but who the hell can pluck their brows with their glasses on? There’s no room to get the tweezers between your glasses and your brow, so the glasses have to go. And plucking my eyebrows while flying blind, I’ve ended up looking like a bald chicken. Same goes for eyeliner; not being able to see is not cute when you’re trying to look good for work or get cute for a night out. So I’m in the drugstore the other day—with my brows in full beast mode—when I come across Tweezerman Expertweeze lighted tweezers. Feeling both adventurous and desperate not to be dependent on the threading salon or friends and family to help with my brow grooming, I forked over the $26. Frankly, I think $26 is pricey for tweezers, but I’ve been happy with Tweezerman products in the past, so I went for it. Admittedly, at first I felt they were a little too lightweight to qualify as a luxury-priced item. But once I clicked the button on the pink plastic handle, turning a pinpoint flashlight on my brows, I was literally like, “This is so lit.” Each little baby hair was like a criminal caught in a searchlight. My tweezers and I had them in our crosshairs! Seeing is one thing and focusing is quite another when you already need a little help seeing things up close, like your phone or a restaurant menu. But the beauty universe works in mysterious ways, especially when you’re a beauty editor and the thing you’ve been praying for lands on your desk—which is how makeup readers came into my life. These are ultralightweight frames with a single lens that swivels on an invisible hinge, allowing you to make up one eye at a time with perfectly clear vision. 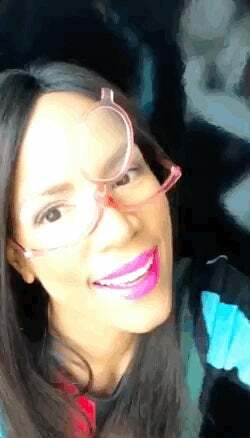 Makeup readers come in prescription strengths from +1.0 up to +3.0 with frames in fun colors like pink or red, basic black or classic tortoiseshell. Check out this tips-and-tricks page for how-tos on wearing glasses with makeup. A few helpful hints? Glasses magnify dark under-eye circles, so concealer is a must. Or have you considered that metallic makeup can sometimes cause reflection-free lenses to become somewhat reflective? How about using makeup to complement the color of your frames? Honestly, I don’t know which one would kill me first: being blind as a bat or at a point where makeup didn’t flip my switch anymore. Thankfully, now I don’t have to find out.